If you have any interest in sports, or if you have some fondness for the 1970s, or even if you like stories about strong women, you really need to read this book. In 1971, a new female tennis player, Chris Evert, appeared on the scene, quietly winning a lot of matches. 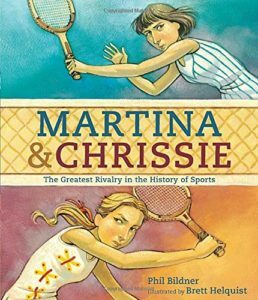 In 1973, Chrissie and Martina Navratilova played for the first time, with Chrissie dominating the match. They became good friends, however. Martina gradually built up her game until she became the dominant player. 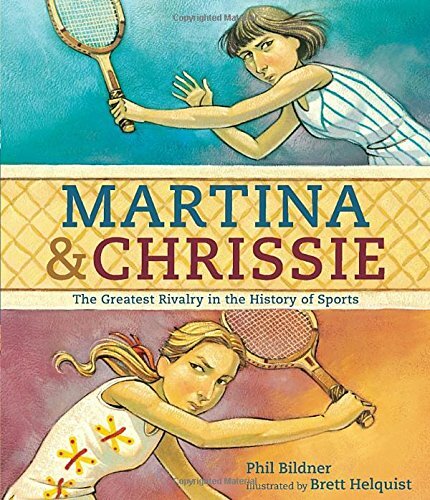 Over the next several years, Chrissie and Martina played each other eighty times in tournaments. Martina won forty three of the matches. They made each other better players and were always the best of friends in spite of coaches and others wanting them to be at each other’s throats. The lively and realistic painted illustrations give the reader the feeling of being there. Kids can see the determination and effort required to play. Their rivalry gives a lot of lessons about friendship and what a good rivalry can do for you. The reader can also learn about this period in history, when the iron curtain was still a consideration.